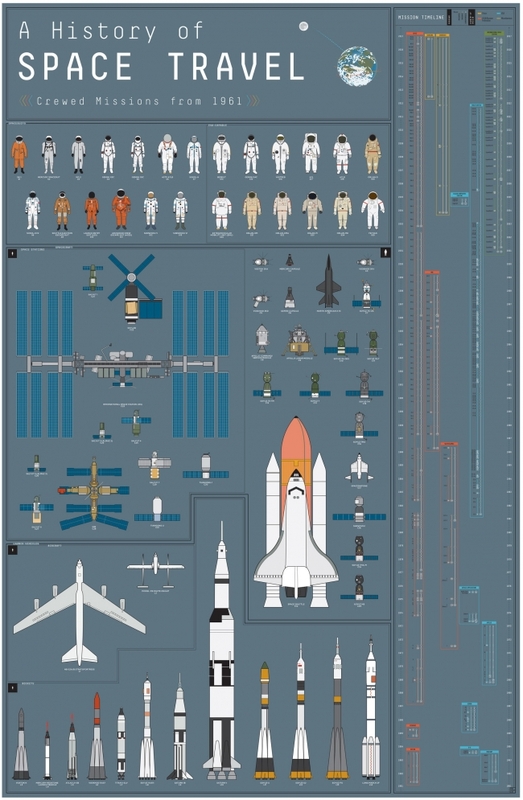 In their latest art print, the guys from Pop Chart Lab celebrates the history of space travel, from 1961 to present day. Make some space on your wall for our second infographic foray into the final frontier! This timeline of crewed space missions maps out over 400 extraterrestrial expeditions, spanning 1961 to present day. From the inaugural space race of Vostok vs. Mercury to the famed Apollo program to the International Space Station, this giant leap of a chart features stellar annotations for each mission, including full-color illustrations of all spacesuits and spacecraft. A simply stunning celestial survey, this chronicling of cosmic voyages is sure to have starry-eyed enthusiasts totally over the moon.